Renee Alway | Where are the models of ANTM now? A finalist from “America’s Next Top Model” might be America’s Next Top Inmate … Renee Alway was arrested recently in connection to a six-hour stand-off with police … who say she was packing heat. It’s a crazy story … Renee — who placed 3rd in Cycle 8 of the show — was popped on June 28 in Palm Springs and slapped with A TON of charges, including suspicion of burglary, fraud, possession of narcotics, forged bills, and committing a felony while on bail* … just to name a few. Here’s what happened … Palm Springs PD says they got a call about a suspicious female lurking around a house that was supposed to be vacant. They responded and allegedly found Alway hiding in the garage with a gun. Cops say they believed another person was also in the house — a male, also packing heat — and called in the SWAT team. SWAT entered and searched the home for hours, but concluded no one else was inside. 27-year-old Alway was booked and remains in jail. Bail is set at $150,000. She’s due in court next week. *NOT SO FUN FACT: Renee was also arrested on June 2 and charged with possession of drug paraphernalia, petty theft, and fraud. She plead not guilty, was released on bail — and then ARRESTED on June 28th. Hence the recent charge of committing a felony while on bail. Wow. To learn more about Cycle 8‘s Renee Alway, visit her bio page here. The 27-year-old former model’s photo released by the Palm Springs police shows her virtually unrecognizable face covered in cuts and bruises after a June standoff with police. Being on “America’s Next Top Model” might be easier than it actually looks — if a brutal mug shot is anything to go by. 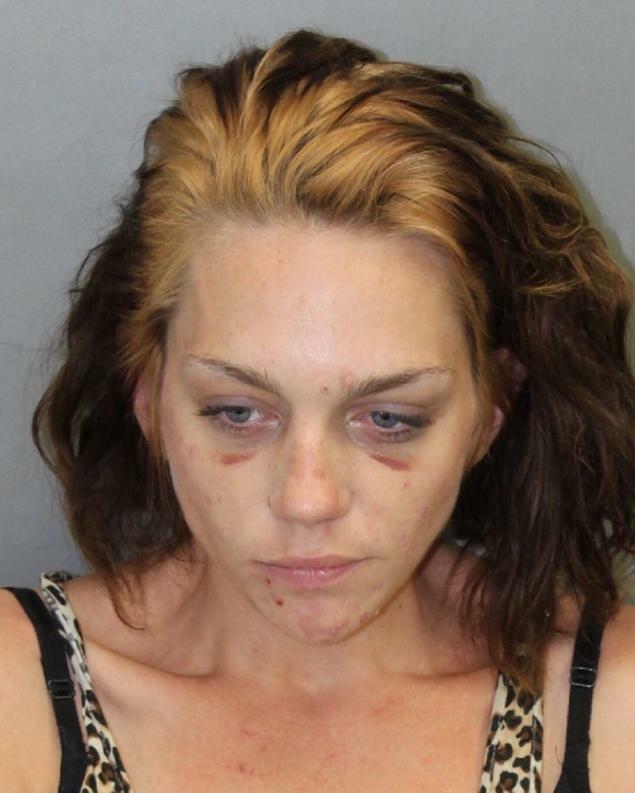 A battered and bruised mug shot of once promising model Renee Alway has been released showing an entirely unrecognizable appearance to the blond woman America once knew and adored. The shocking face is the brutal aftermath of a six-hour armed standoff with police in California last month, according to authorities in Palm Springs, Calif.
Red bruises and cuts appear under the 27-year-old’s eyes and chin. Her face tilts downward — this time away from the camera lens she once shined for. Alway, who was one of three finalists on the program in 2007, was arrested June 28 and charged with first and second degree burglary, fraud and committing a felony while released on bail. Police say they found her hiding while armed in the garage of an unoccupied home whose owners were out of the country after concerned neighbors reported seeing a suspicious-looking woman walking around. A violent standoff with police ensued when an armed man was believed to also be inside the house, bringing the SWAT team in. Alway was the only one found at the scene. Always’ bail was set at $150,000 with a court appearance scheduled for Thursday. Perhaps even more shockingly is that this was the former model’s at least fourth arrest this year, the Desert Sun reports. Those prior arrests include two in April for grand theft of more than $400, grand theft with a firearm and receiving stolen property. In June she was arrested twice more for drug paraphernalia, petty theft and fraud, TMZ reports.